Google My Business connects you directly with customers, whether they’re looking for you on Search, Maps or Google+ for only 2,999 baht. Yes, i want to Get on Google! Give your customers the right information at the right time, whether that be driving directions to your business in Maps, hours of operations in Search or a phone number they can click to call you on mobile phones. Graphic profile Graphic layout of the cover image and profile picture, so there is a common thread in relation to your website and / or Facebook profile. Company Description Brief description of your company, where the main benefits of your products and services are highlighted. Telephone numbers and hours are also included, making it easy to get in touch with you. Account approval We take care of the approval process at Google. You just need to be aware of the authentication code sent to you by Google. The rest to us. Why do I need Google My Business in Thailand? 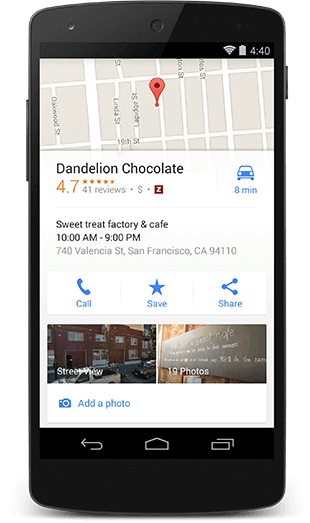 Google My Business comparable to the function of a recording of a phone book had in the past – it is a single company profile that gives your customers easy access to info about your company. Google My Business is tightly integrated with Google+, so when you create a Google My Business profile in Thailand is also created automatically a Google+ profile for your company. With a Google+ profile gets your company another opportunity to interact with new and existing customers via social media. We recommend that you immediately get up a Google My Business profile.